Another one for the road! Auto brands in India seem to be having a ball on the web, and why not? The TG they want to reach out to, is here! We've covered Ford Fiesta and Toyota Etios Liva earlier and the Jetta promo has been on for a while. This one is a bit late in the day though but I have been meaning to do this post for a while. 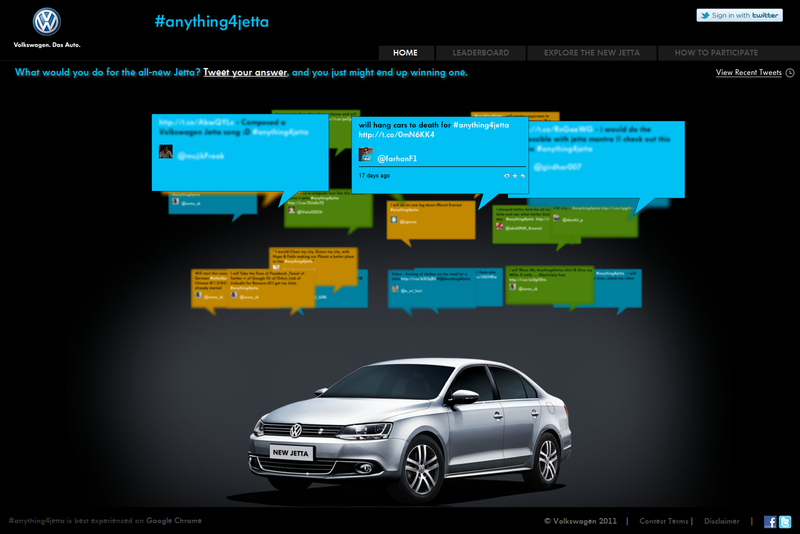 Ok so I downloaded Google Chrome to view the site - ‘anything4jetta’! The Twitter clouds on the site have been optimized for Chrome, therefore! The site profiles the campaign that Volkswagen has been running across the web (pretty successfully I would think going by the fact that #anything4jetta was trending on top a week back!). I have seen some nice publisher integrations pushing the Twitter promo as well. The premise is simple, all you need to do is register on the site and tweet, to what length you would go to own the Jetta. You could stand a chance to win branded watches, tees and laptop sleeves. They have an MTV extension to the contest as well where the final selected winners will be called in for a programming integration. 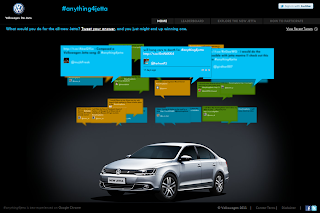 The rest of the site is simple – Jetta feature summary (clicking to the Volkswagen site for details), Winner Leaderboard (could have been laid out better, design-wise), participation details and social media co-ordinates.